If you used the broadest reasonable definition for "partial eclipse," how many more solar eclipses would be on the list? Probably the answer is zero. But what about lunar eclipses? Couldn't it be that there were more dramatic/total lunar eclipses in Greece during that time? Have you checked those records? And are we sure the Greek means eclipse of the sun? We probably are, but maybe the genitive means something else there. Well, he says specifically: "eclipses of the Sun". Never mentions the Moon. As far as any other solar eclipses, the answer is exactly zero. An annular eclipse IS a partial eclipse everywhere except directly on the very narrow eclipse path itself and even then is annular only for the few minutes, if that long, it takes for the annularity to exist. They are partial eclipses the rest of the time. The same is true for total eclipses. So there are only two types of solar eclipses: total and annular. To repeat, only during the few moments on the rather narrow eclipse path itself do these eclipses vary from being "partial". So, yes, the list has been thoroughly checked. Actually, lunar eclipses are slightly less frequent than solar eclipses but, each one being visible over what amounts to more than a hemisphere of the Earth at any time - which is much, much, much larger than the solar eclipse path, which at best is only a few miles wide, they seem more frequent. But, again, our author only referred to solar eclipses. So, the real issue here is that when he mentions these eclipses, he's in the middle of telling us how thoroughly he's checked his facts, yet on this one fact at least he seems to have allowed himself to be persuaded by his perceptions rather than by reality. The moral is: we have to keep in mind that our author may not be as objective as he claims. Now, it's possible that he could have heard about one or more of the annular eclipses in the list from different sources and, it being the 5th Century BCE with everyone using their own calendar, he was unable to verify their dates as being congruent. It's also possible that the total eclipse which passed over the area after the war counted in his mind as being - well, plus or minus three years - within tolerance. This attitude would not at all be unusual for someone at that time. Anyway, one of my goals in reading this is to look for the author's objectivity or impediments to his objectivity. I'm not at all trying to imply he was consciously dishonest. I don't get the impression that he was. But an unverified statement is less reliable than it could be. I think it's important. I've been secretly trying to keep up with your reading... Because I don't know if I can commit myself to this one year enterprise, but I'll try for some time! 1) What you say about solar eclipses is interesting. According to E.C. Marchant's commentary on that passage, the eclipses occured in 431 B.C. (Thuc. 2.28), the other in 424 B.C. (Thuc. 4.52). As far as I understand those two other passages, Thucidides describes real solar eclipses and not some other phenomena (lunar eclipses, sky covered with volcanic ashes etc.). So if they never happened, that of course casts some doubts on his methods in general. Are those solar eclipse calculations 100% accurate? I don't know much about the subject, but I remember the movements of the moon being notoriously unpredictable. I remember somebody tried to solve the problem of longitude by observing the moon, but that proved too complicated. Of course, mathematics have taken a leap forward since then... Still, wouldn't it be relieving if old Th. weren't talking nonsense? 2) Language question. Why is ἔστι in the present tense in the middle of this? estin ois is a dative case example of a phrase that means some; the antecedent has been dropped, and when it is used with a preposition the preoposition goes in the middle. See Smyth 2514. Also Th. 5.25.2. The eclipse you mention in 431 BCE corresponds to -0430, so they are probably the same one. The other one you mention, in 424 BCE (=-0423), cannot be correct. There were two solar eclipses in that year. 1) March 21. The eclipse path ran from England through Denmark, up over Stockholm, through central Finland and then out over the Arctic Ocean just east of Murmansk. This was an annular eclipse. 2) On Sep 14. Curved from just south of South Island New Zealand across the South Pacific into Antarctica. This was a total eclipse. Neither of these eclipses would have had any visible impact in Greece. Which is why they didn't appear in my earlier list. They're much further away, and so even less apparent from Greece, than any of those that did appear in the list. As far as accuracy goes, yes, the results are very reasonably accurate. The major issue is the Earth's rotation, which is not constant. But when corrections are applied, they result in errors which amount to at most a few minutes of time or at most a few miles in geography, nothing more. NASA publishes all this data and it's very good and very reliable. As to the circumstances of the individual eclipses, i.e. are they annular or total, that information is absolutely correct. The longitude problem you mention is interesting. They tried using the Moon, the Galilean satellites of Jupiter, and maybe one or two other things, and all failed. But the issue isn't in the motions of the Moon or even the mathematics, which is really pretty simple (all you need is the ability to read tables and do some simple addition and subtraction - and have an idea of why you're performing the steps you are taking) but rather that, prior to modern navigational aids such as LORAN and especially GPS, the thing you most needed was an accurate watch that you could rely upon at sea or anywhere else. You would keep the watch set to some standard time (the English used the mean time at their Greenwich observatory - which was later adopted internationally) and that, compared with the local time, obtained by observation, gave you your longitude. By the middle of the 18th century the issue had been pretty well reduced to this time-keeping problem and the British Admiralty offered a huge (at the time) 20,000 pound reward for an accurate time piece which was won, and after much struggle which finally involved none other than King George III himself who said, essentially, "pay the man or I'll find out why", paid off, by a west country commoner named John Harrison. The description in Book Two does appear to represent the eclipse of August -0430 mentioned in my list. This eclipse was annular over central Anatolia. To an observer in Greece, it would have been always partial. He says that the some of the stars came out and that the Sun took on a crescent shape, which is exactly how it would appear from nearby, that is, in Anatolia or from somewhere up the western Black Sea coast. Now, anybody looking at the event would never look at anything again. Before the time the pain of having their eyes burned out had traveled the short distance from their eyes to their brains, they'd be already blind. For life. You literally cannot, you do not have enough time, to avert your vision. But they could have observed indirectly. Images of the Sun shining on the ground through gaps in tree leaves will produce crescent shapes while the eclipse is going on. We observed this effect in the 1994 eclipse. So this one, I think, is a reliable report. And he's got it at the right time of year. As a final word let me say that I want to point out that this does NOT necessarily reflect badly on Thoukydides' character. Every empire, kingdom, religious group, little city state, whatever had their own calendars and their own way of counting years and even of defining years. The Egyptians had at least two, and maybe a third, all going at the same time. Centuries after the Peloponnesian War we find Cicero writing to Atticus asking for help in correlating Roman consular lists with Athenian Archon lists, et al. There was no such correspondence in existence at the time. So it would not be difficult for our author to receive information about, say a single annular eclipse event, and, being unable to correlate, unable to apply corrections, not to mention the imprecision inherent in human memory, think he had a number of different eclipses on his hands. In addition, if we can believe all of them, there were about twice as many people at the famous Ice Bowl game between the Packers and the Cowboys than the stadium actually held. I think you get my point. In other words, the so-called eclipse in -0423 (which he does not otherwise specify), could very well be attributed to one or more of the issues above - particularly if he was writing about it some years after the presumed event. At any rate, he doesn't tell us where this particular event was observed. Or maybe Thoukydides just wasn't as careful as he would like us to believe. The question to keep in mind is: what irons did he have in the fire? And he had some. Keep your eyes open and your critical abilities sharp. I think you'll enjoy the readings more. I know I will. τῶν δὲ πρότερον ἔργων μέγιστον ἐπράχθη τὸ Μηδικόν, καὶ τοῦτο ὅμως δυοῖν ναυμαχίαιν καὶ πεζομαχίαιν ταχεῖαν τὴν κρίσιν ἔσχεν. What is the subject of ἐπράχθη? And what is the object? Is there an article missing? Is there a supressed "to be"? What steps do you follow in understanding the structure of this? Paul Derouda wrote: I've been secretly trying to keep up with your reading... Because I don't know if I can commit myself to this one year enterprise, but I'll try for some time! "He records two eclipses of the sun, one in 431 B.C. (2.28), the other in 424 B.C. (4.52), but if the Ten Years' War be meant, three eclipses could have been observed in Greece; or it the Twenty-seven Years' War is alluded to, six. Of course it is not certain that all of the eclipses were actually observed; Thuc., as Mr. Forbes says, only gives the popular opinion." I'm not sure where Marchant gets the six number from. But I think his last point is a good one in light of the μνημονευόμενα. It is not Thucydides memory that is in play. Moreover, if one were to develop an eclipse thesis, one would want to look at the seasons when eclipses happened because those occurring during rainy seasons might go unnoticed thereby skewing the frequencies, observed and remembered, in favor of those that happened on sunny days. Firstly, What is the source of Marchant's information? The quote given is very unspecific. I suspect that Marchant had no reliable information about eclipse paths in antiquity and accepted Thoukydides' remarks at face value. It's quite reasonable - he wasn't able to check them. Therefore, he would start talking about an eclipse in -0423 (=424 BCE), because that's the date that's indicated in the text, without knowing that there wasn't one. I think an innocent man may have been introduced into this discussion. 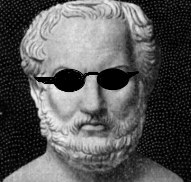 Secondly, keep in mind that Thoukydides only mentions two eclipses, and says that eclipses were more frequent during the Peloponnesian War. That's what we're talking about. Any others are irrelevant to this discussion. Thirdly, It has been demonstrated by NASA that there was NO eclipse visible in Greece or environs in 424 BCE. None. Zero. Nada. Zilch. So the report of one is in error. That does not in any way absolve Thoukydides' memory. It doesn't indict it, either. I have indicated several reasons why this error could have occurred. I'm sure that list of reasons isn't exhaustive. Fourthly, the list of eclipses that came to or near Greece in the time period indicated is exhaustive. It doesn't matter whether they happened in rainy seasons, dry seasons, or whenever. If they didn't exist, they could not actually have been observed under any conditions. But reports of "eclipses", whatever they are in reality, can be misunderstood, poorly collated, poorly dated, whatever. And again, that has absolutely nothing at all to do with the local weather or climate. Anyway, we haven't been talking about any unobserved eclipses. Quite the opposite. In particular, we're talking about one that was reported (in the text) which did not occur. a) The report in Thoukydides of a solar eclipse visible in Greece or environs in -0423 (=424 BCE) is in error. For whatever reason, it is in error. b) His report of an eclipse in -0430 (=431 BCE) seems to be valid. Good for him. c) It does not appear that there was an unusual number of eclipses visible in Greece during the Peloponnesian War. Despite what Thoukydides says. His statement could be attributed to faulty reports, faulty personal impressions, personal druthers whatever. Bias or error, it happens all the time. d) These are examples that show that what he says isn't necessarily what happened. That's all. It's not an attack on Thoukydides or anyone else. It just recommends that verification be applied whenever possible and to look out for personal biases. That's all. That's all, folks. That's all. I hope that's all. I think the subject is the two words right after the verb. I translated it as something like: "The Medik (War) was the biggest one fought of all those earlier ones and yet this one got a speedy end in two sea battles and two land battles. Steps? I don't know that I have a procedure. I guess, when in doubt, look for the verb then try to identify all possible nominatives as candidates, not forgetting that it might be contained in the verb. In this case there's only μέγιστον and τὸ Μηδικόν. Both neuters, so one probably goes with the other. The actual subject is most likely the one with the article. Then run a trial translation, see if it works contextually, and can I find any grammar that would go against my translation? If not, then onward. My point about weather is just that if there was a raging thunderstorm during a (partial) eclipse early in the century, arguably nobody will have noticed it, and therefore it will seem as though there were more eclipses later. Too bad we don't have weather reports from NASA for those days. Last edited by pster on Tue Jan 24, 2012 10:00 am, edited 1 time in total. So I checked out the NASA pages briefly. There was an eclipse in 424. The path was north of Greece. NASA dates it in March. Thucydides says that it happened at the beginning of the summer. It is a fun paper and has lots of nice pictures. Highly recommended. I know about that eclipse and referenced it in one of my earlier posts. The descriptions you reference are modern interpretations of what an eclipse looks like. They rely on predictive techniques and instrumentation not available to the ancients. I've seen solar eclipses from even closer than the distance from Scandinavia to Greece and I'll tell you right now at that distance, you have to know that an eclipse was taking place. A 71% diminution in the Sun's light seems like a lot, and it is, but even then Sun is still so very brilliant that it's blinding. You can't look directly at it even when it's even 99% covered. The light shining through what are called "Bailey's Beads" on the edge of the Moon is intense. And that is more than 99% coverage. Believe me. I observed a partial from Madison just a few years ago. It was near Christmas. It got up to something in the area of 50% coverage. If you didn't know the eclipse was on, you would never have noticed the diminution of light. It made no impression at all on the community. So I repeat, I don't think this eclipse is a candidate. I would like it to be. But it doesn't seem like it is. You have to be much closer to the center line to notice it casually. But I'm glad you're looking this stuff up on your own. That's what I'm trying to generate. I suppose what's misleading you is πρότερον, which is an adverb here (or something), and does not go with the other neuters. τὸ Μηδικόν [ἔργον] is subject and μέγιστον is predicative. Bob, about the longitude problem: The reason they were trying to chart the movements of the moon or the satellites of Jupiter was precisely that they didn't have any reliable watch set to standard time, as any watch before John Harrison's chronometre was next to useless on the sea for this purpose. They thought they could observe the moon or Jupiter's satellites, compare their observations to pre-made charts and establish standard time like that, and this standard time compared to the local solar time would permit to establish longitude. Just imagine how difficult it would have been, peeking at Jupiter's moons and trying to make out their relative positions on some shaky little ship! Paul Derouda wrote: Bob, about the longitude problem: The reason they were trying to chart the movements of the moon or the satellites of Jupiter was precisely that they didn't have any reliable watch set to standard time, as any watch before John Harrison's chronometre was next to useless on the sea for this purpose. They thought they could observe the moon or Jupiter's satellites, compare their observations to pre-made charts and establish standard time like that, and this standard time compared to the local solar time would permit to establish longitude. Just imagine how difficult it would have been, peeking at Jupiter's moons and trying to make out their relative positions on some shaky little ship! Well, sea-borne observations are very difficult, yes. As for the rest, yes, I think that's what I said, or tried to at any rate. Regardless, the system still required sea-borne observations but now, for the first time, they had a reliable base-line to compare them with. So I am in full agreement with you on this. Absolutely. As for the eclipse of -0423 (=424 BCE): Here's how it works. Astronomy uses a magnitude scale derived from work originally performed by an ancient Greek, Hipparkhos. Hipparkhos started with the brightest stars in the sky, which he called "first magnitude" and then went on down through "second", "third", etc., until he got to "sixth" which was as faint as he could see. OK. So we have a difference of five magnitudes between the bright ones and the faint ones. Well enough. There is where matters stood until the 19th century when technology allowed astronomers to actually measure, as opposed to estimate, stellar brightnesses. Taking representative first and sixth magnitude stars, they discovered the sixth magnitude stars are actually about 100 time fainter than first magnitude stars. In other words, the human (and presumably this is true for other animals as well) visual system is skewed to prevent the bright objects from swamping the faint ones. Fainter objects appear much brighter to us in relation to brighter objects than they really are. Further investigation revealed that representative stars of any given magnitude were about 2.5 times brighter or fainter than stars of neighboring magnitudes. So the astronomers institutionalized it. They defined a difference of one magnitude as being a difference of the fifth root of 100 times in brightness (= approx. 2.5). For reference, all the stars in the Big Dipper are second magnitude stars except the one where the handle joins the bowl. That guy is a third magnitude star. Polaris is also a second magnitude star. So, to get the actual difference in brightness between two objects, using the difference in magnitudes between them as an exponent you get 2.5 ^ difference (where "^" means use the following number as an exponent). A difference of five magnitudes is then 2.5 to the fifth power which is: 100. Once the measured magnitude scale was defined, astronomers could talk about an extended range of magnitudes - and they did. Let's take some everyday examples. On this extended magnitude scale they placed the Sun and the Moon. The Sun is very nearly at -27 magnitude (very, very bright as the negative sign indicates). The Full Moon is about -13 (very, very bright). Those numbers look very close, don't they? 27/13 is just a bit more than 2. So the Sun isn't all that much brighter than the Full Moon, right? It's 2.5 to the 14th power times brighter than the Full Moon. I'll do the math for you. That's about 400,000 times brighter. I kid you not. It is extremely bright. Now a 70% obscured Sun, in the eclipse you're talking about, shines about 30% brighter than normal. In other words, it's only about 1/3 as bright as before. How does this compare to a Full Moon? You can do this one in your head. 1/3 of 400,000 is about 130,000. A 70% obscured Sun is about 130,000 times brighter than a Full Moon! Next time you see a Full Moon, imagine something about 130,000 times brighter and you have a Sun as it was visible from Athens during the eclipse of -0423. Now tell me about how noticeable the diminution of sunlight would be to you. That's also an example of how skewed the human visual system really is. And it's an evolutionary plus, an advantage to the user. That's why things in nature happen that way. The annular eclipse of 1994 that passed over central Illinois was, in Madison, more than a .9 magnitude eclipse (here's where I don't like the way astronomers use the term - it means something different here, it means diminution from full brightness). More than .9, not .7 as the eclipse of -0323 was in Athens. More than .9. And it didn't even stop traffic in Wisconsin, except for those who actually knew there was an eclipse taking place. Madison is a lot closer to the center line of the 1994 eclipse than Athens was to the center line of the -0323 eclipse. A lot closer. Moral, you have to be very close to the center line. Not hundreds of miles away. In 1954 a total eclipse passed just north of Denmark (about the same as the -0323 eclipse) and then passed over Lithuania. This eclipse was observed in Austria - only by those who knew it was taking place. I know. I was there. Austria was a lot closer to the center line of this eclipse than Athens was to the eclipse of -0323. We had a .79 (not a .72, a .79) eclipse. Spectacular to people who write papers, yet nothing out of the ordinary was visible to the casual observer. Most of the people on Textkit have probably been in that position relative to a solar eclipse, yet wouldn't have noticed (even if they did) without being told about it. I would dearly love for that eclipse of -0323 to be the one Thoukydides was talking about, but I just can't vouch for it. Bob, if a .71 eclipse happened at a baseball game with 20,000 people in the stands, how many people would notice? OK, that's what I figured, but I don't know what the verb would be. Can you give me a good translation of the verb as used here? And, and a translation of the correlated active version? I'm probably just being dense, but I couldn't come up with a suitable English translation that makes any sense and works both passively and actively. Seems like the translators have difficulty with it also and thus typically opt for the copula. I see this has been answered at least twice. I am not certain that πρότερον is adverbial. It could be an adjective used with μέγιστον. There seem to be two clauses here, the passive verb ἐπράχθη PRASSW where the subject is the substantive μέγιστον limited by [πρότερον?] τῶν ἔργων. Either the substantive μέγιστον or the whole ἐπράχθη clause stands against τὸ Μηδικόν where the verb "to be" is not really suppressed, but unnecessary. The procedure I follow is to isolate the main verb ἐπράχθη and then look for verb "arguments" μέγιστον, τῶν ἔργων, πρότερον. Assign each argument a semantic and a grammatical role, e.g., agent, patient, goal, instrument, subject, object, qualifier. Thanks CSB, but can you translate the passive PRASSW here and the corresponding active PRASSW. The Persian war was done greatest of previous (wars). Is that how you translate it most literally? C. S. Bartholomew wrote: I see this has been answered at least twice. I am not certain that πρότερον is adverbial. It could be an adjective used with μέγιστον. There seem to be two clauses here, the passive verb ἐπράχθη PRASSW where the subject is the substantive μέγιστον limited by [πρότερον?] τῶν ἔργων. Either the substantive μέγιστον or the whole ἐπράχθη clause stands against τὸ Μηδικόν where the verb "to be" is not really suppressed, but unnecessary. I translate: Of earlier wars the biggest [to happen] was the Medic. I don't know if adverbial was the right word for πρότερον. But don't think it's used with μέγιστον. I suspect you are right. It could limit the verb ἐπράχθη or the whole clause in either case it would function as an adverb. What I find intriguing about the syntax is the absence of a relative pronoun. The clause with ἐπράχθη is subordinate. Does anyone favor reading τῶν as a relative? τῶν δὲ πρότερον ἔργων μέγιστον ἐπράχθη τὸ Μηδικόν. The Greeks and the Persians made TPW greatest of the earlier events. The DJs and the dancers made the party raunchiest of the earlier parties. The party was made raunchiest of the earlier parties. TPM was made greatest of the earlier events. Note how PRATTW in the passive is almost like a copula. Perhaps this connects with its being able to take two accusatives in the active. One of the morals of the pdf in the other thread is that each verb has its own quirks that you need to master, especially when it comes to the non-active forms. pster wrote: I just finished reading the pdf in the apothneskw thread about how passives are really pretty middle. 1) why is προυφειλομένης in the genetive? 2) μάλιστα μὲν ὡς καὶ ξύμφορα δέονται: WHAT does this MEAN? 1) I think it is in the genitive for the same reason that εὐεργεσίας is genitive: δεησομένους takes the genitive. 2) I think it means that most of all they want [something] expedient (ie useful for those receiving the request). Marchant says that ξύμφορα is an internal accusative, but I don't see how that can be the case since expedient seems to externalize the meaning quite a bit. But maybe I don't understand Th. or internal accusatives or both. I hope I got at least one of them right. 1) is clear now. I just couldn't link προυφειλομένης with δεησομένους, too many interfering words... I somehow thought it wasn't on the "same level" as the other genitives (whatever the correct grammatical term is, I thought it governed the other genitives or vice versa). It's a tricky sentence. Hopefully some others will chirp in with their takes on it. I still don't see how it is internal. Paul Derouda wrote: 1) is clear now. I just couldn't link προυφειλομένης with δεησομένους, too many interfering words... I somehow thought it wasn't on the "same level" as the other genitives (whatever the correct grammatical term is, I thought it governed the other genitives or vice versa). all as part of the substantive participle serving as the subject in this construction. Thanks Nate. I would bet that you are correct. What I couldn't produce was the "[who are] without." It seems a bit of a cheat to get "without" from μήτε. Really, what needs to be supplied is "who are without." Do you have a Smyth number for that? I'm probably just dumb, but can you explain how you get that. Probably you're right. But I have the same problem as pster in producing "[who are] without". Should I interpret something like this? μήτε εὐεργεσίας μεγάλης = "neither x"
μήτε ξυμμαχίας = "nor y"
προυφειλομένης = "[who possess] ... that is z"
As a newcomer to this forum, I hope you won't mind my commenting. Surely what we have here is a simple genitive absolute construction, describing the circumstances in which the request is being made. 'Proupheilomenes' (apologies for not yet having sorted out how to type in Greek!) is passive, and means 'already being owed'; in other words, the Corcyraeans are making their request for aid without any existing debt for previous alliance or great service already being owed (i.e to them by the Athenians); in other words, they are venturing to make their request even though no such debt is owed to them. Paul Derouda wrote: Probably you're right. But I have the same problem as pster in producing "[who are] without". [who are] of neither great kindness nor alliance [that is] meriting a long overdue payment. that would [now] merit a payment". I've seen something of the sort in the older English translations. Though I'm new to the forum, I hope you won't mind my commenting. As I understand it, προυφειλομένης is a passive participle in the genitive absolute construction, meaning '[with something] already being owed'. It is used to describe the circumstances of the Corcyraeans' request to the Athenians: they are making their request with no debt for alliance or great service already being owed, i.e, even though no such debt is owed to them by the Athenians. This use of the genitive absolute is common in Thucydides. I hope this helps; I'd be happy to discuss further. I'm really pleased to see that others have embarked on reading Thucydides - reading (and re-reading) him in Greek has been one of my greatest pleasures in recent years. On the basis of my own experience, I would advise those tackling Thucydides to get hold of (in hard copy or, where available, online) as many different commentaries on his work as possible. Thucydides is a notoriously difficult writer, and even today there is no consensus on the exact meaning, or the precise grammatical construction, of many passages. This makes it all the more important to consider a wide range of scholarly opinions, and on that basis to decide which interpretation one favours. Of 'school' editions of individual books, the old Macmillan series (variously edited by Marchant, Graves and Tucker) is, as far as I am aware, the only one to cover all eight books. Generally superior to these is the series published (on the basis of Classen's edition) by Ginn and Co. of Boston in the late 19th/early 20th centuries, and edited by Morris, Smith and Fowler: unfortunately, this series covers only Books I, III, V, VI and VII. I see that at least one poster is already using Morris' edition of Book I. Other commentaries on individual books which I have found helpful are Cameron's Thucydides Book I: A Students' Grammatical Commentary ((University of Michigan Press, 2003); Rusten's Thucydides: The Peloponnesian War, Book II (Cambridge University Press, 1989); Spratt's Thucydides Book IV (Cambridge University Press, 1912); and Goodhart's The Eighth Book of Thucydides' History (Macmillan, 1893). Of complete commentaries, the English commentary most helpful in considering difficult passages is that by Gomme, Andrewes and Dover (Oxford). The Bude edition by de Romilly, Bodin and Weil (Greek text, with translation and notes in French) is also very useful. Among older editions with commentaries my personal favourite is the shorter version of Poppo's edition, revised by Stahl (normally referred to as 'Poppo-Stahl'), with notes in Latin. The edition by Classen, revised by Steup ('Classen-Steup'), with notes in German, is generally regarded as the best; Krueger's edition (again with German notes) is also worth consulting. Moving away from commentaries, Betant's Lexicon Thucydideum (1843; repr. 1961) is a Greek-to-Latin dictionary of words found in Thucydides. While not complete (e.g. particles are omitted), it is very helpful if one wants to track down other instances of a word in Thucydides to help one decide how to translate it. Karl Maurer's Interpolation in Thucydides (E. J. Brill, 1995) includes illuminating discussions of some very difficult passages. The secondary literature on Thucydides is of course huge, but I'd like to put in a special mention for W. Robert Connor's Thucydides (Princeton University Press, 1984), an enormously stimulating sequential 'reading' of Thucydides' history, which can be read with great profit in parallel with the text of Thucydides. I hope all this is helpful; I'd be happy to provide any further information. Last edited by John W. on Mon Feb 13, 2012 5:49 pm, edited 3 times in total. John W. wrote: As I understand it, προυφειλομένης is a passive participle in the genitive absolute construction, meaning '[with something] already being owed'. It is used to describe the circumstances of the Corcyraeans' request to the Athenians: they are making their request with no debt for alliance or great service already being owed, i.e, even though no such debt is owed to them by the Athenians. This use of the genitive absolute is common in Thucydides. What kind of ἂν is this? I don't see a subjunctive around, and this seems to be doubly subordinate clause. So I'm confused. Of course relatedly, what kind of εἰ is this? my head is banging and I'm at a loss. a different case altogether--see John W.'s post above). Yeah, the notes are more confusing than the text. I wouldn't say I'm tackling the book; perhaps more accurate to say it is tackling me. But I am patient and have warned Mr. Thucydides that I will prevail even if it takes me longer to read the book than it took them to fight the war!! As for the John W. sentence, I gave up on that one. I have an eight hour time limit for any one sentence. Glad to see you are chiming in from time to time Nate. I knew you wouldn't be able to keep away. I suspect spiphany and Scribo will feel the pull soon. pster wrote: As for the John W. sentence, I gave up on that one. I have an eight hour time limit for any one sentence. Pster - sorry for the delay in commenting on that sentence. I did attempt to post a reply on it last Saturday, but it seems that, for some unknown reason, all my posts are being moderated, and that one never appeared, so I had to repost it during the week. I can help with your query on I.33.2, and will do so today, if this post makes it onto the forum! I think it's a past potential, H. W. Smyth's Grammar §1784 ff. And if I'm wrong about that, that's where you'll find a discussion of ἂν with indicative more generally. 2353b of Smyth seems key. Notice how he picks up on ei almost meaning "since" just as Morris does in his commentary. But I have to say, that is the only section I have come across where I think Smyth totally drops the ball. The repeated rephrasing and all the parentheticals are symptoms of an explanation that is failing. Furthermore, the use of "it is true that" and "it is the case that" are really hopeless. First of all, they are not in the Greek. Second of all, there is a whole theory of truth in semantics according to which saying "it is true that P" just is saying "P" --the disquotational theory of truth--and it is quite well motivated, so I have no idea how Smyth thinks that bringing in these phrases clears up anything. Can anybody unravel it for me?